Thanks for stopping by and be sure to watch out for other sneak peeks every day this week! Hello, Connie Nichol here today with a scrapbook layout and a card featuring a die set that will be released next week. 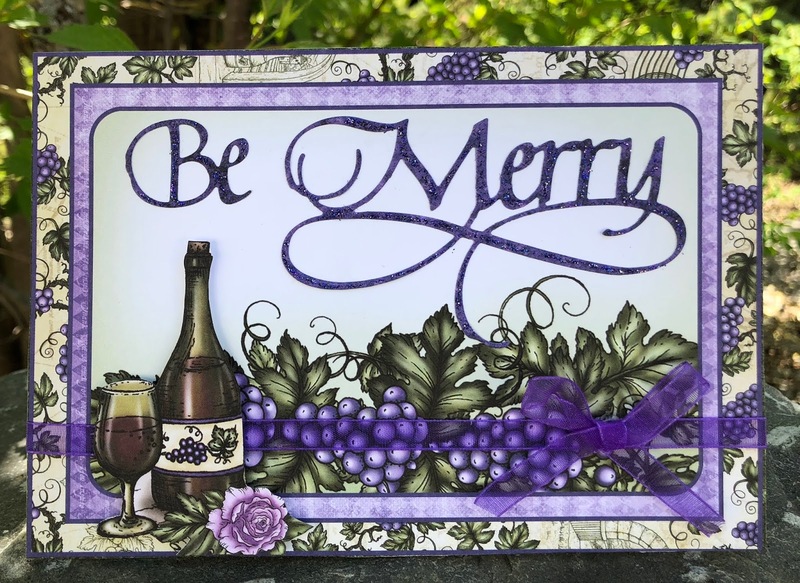 I love being able to give you a Sneak Peek at projects I designed with Eat, Drink and Be Merry from Suzanne Cannon's new collection of dies and stamps! 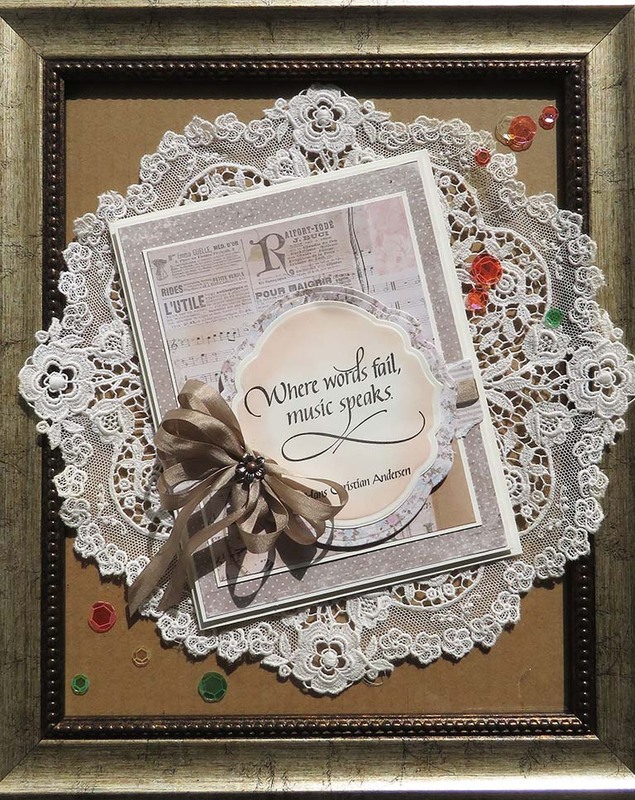 You can see many more projects on the Elizabeth Craft Designs blog and web site on June 5 - not too long to wait! This is such a versatile die set. You can use the words all together, like I did on the layout below, or use them separately as the occasion warrants. 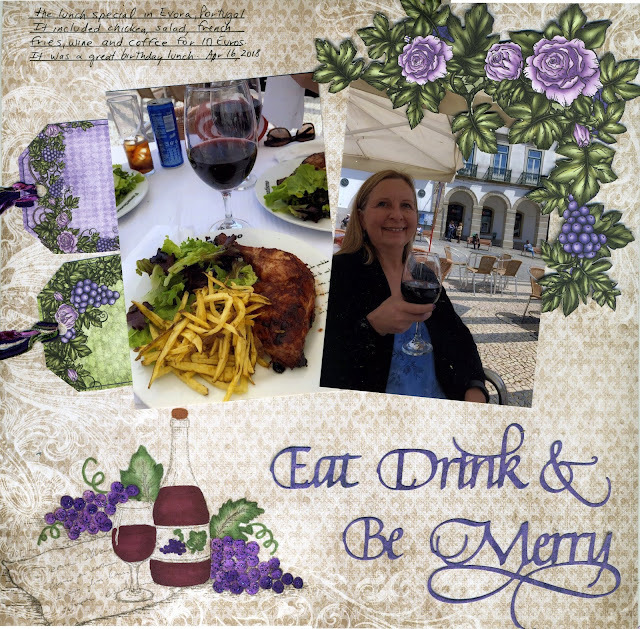 I have seemingly a gazillion pictures of eating, drinking ad being merry, so these word dies make a perfect page title for many future scrapbook pages and cards. Supplies Used: Heartfelt Creations patterned paper, Elizabeth Craft Designs words dies, Chameleon pens, Scrapbook Adhesives by 3L adhesive, Stickles glitter glue. 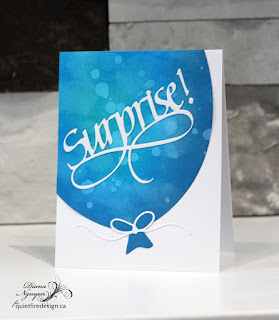 I'm so excited to share a Sneak Peek at a project I created with the Big Balloon die and Surprise die from Suzanne Cannon's new collection of dies and stamps, available to view in its entirety on the Elizabeth Craft Designs blog and web site on June 5. How many of you watch all those videos on making different backgrounds with distress and alcohol inks and you just never end up making a card with them? *raises hand* And despite all the cards you make, you're still in need of a quick one sometime? *raises hand again* I LOVE this new balloon die because I whipped out 3 cards in 30 minutes. 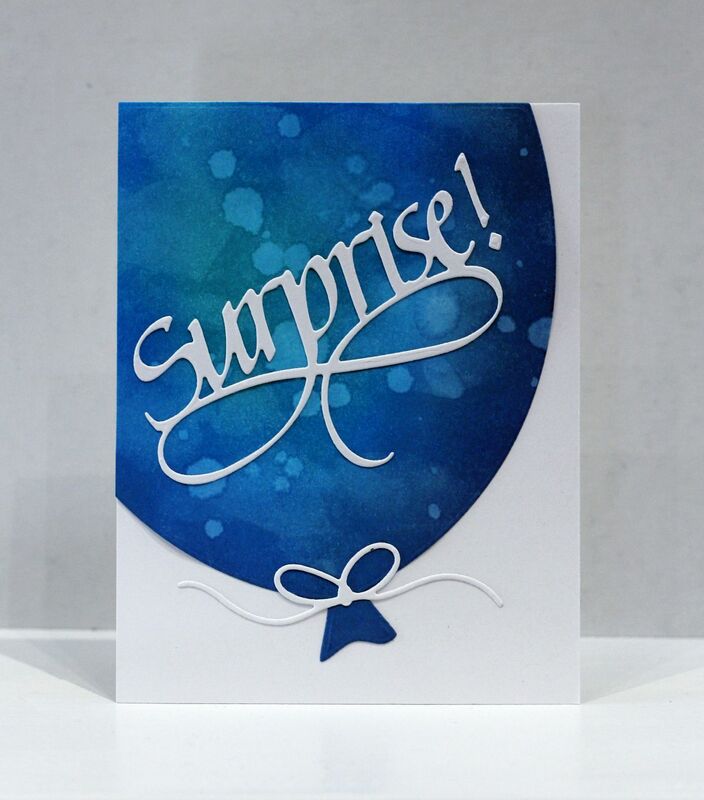 I grabbed those backgrounds, die cut out the balloon, sponged the edges so that it gave the balloon a more rounded look, slapped it on a white card base and glued the new Surprise and bow on there. (You'll have to wait to see the other 2 cards because this is just a Sneak Peak, you know!) 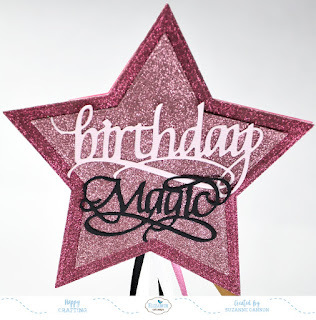 So easy to personalize with any color palette and so many new word die choices coming - though the old ones work too! You're going to want to check back every day this week so you don't miss all the Sneak Peeks and then the release on June 5th! Hi and happy Monday to all of you! 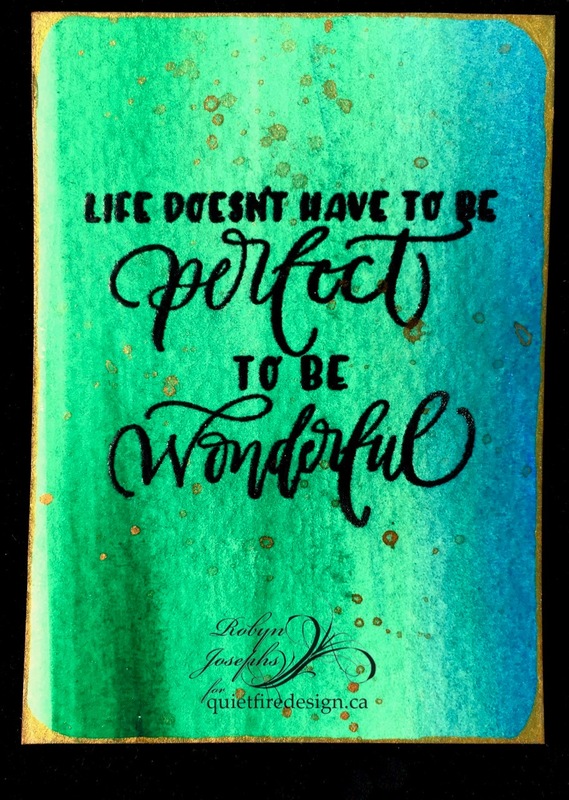 I have a really pretty card that i created to share with all of you from our newest release of the Quietfire Rubber stamps. This one i really love because it gives such a positive message and would be perfect to send someone who needs a little lifting up or even a family member who just needs some positive inspiration in their life. 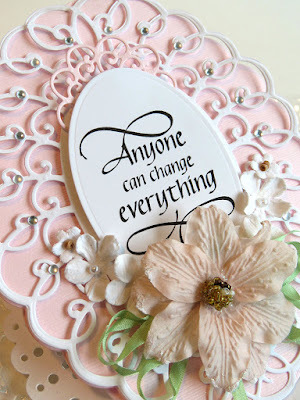 I used soft pale pink for my backround of my card and cut the swirled die from Becca Feeken in white to add a beautiful feminine feel to the card. 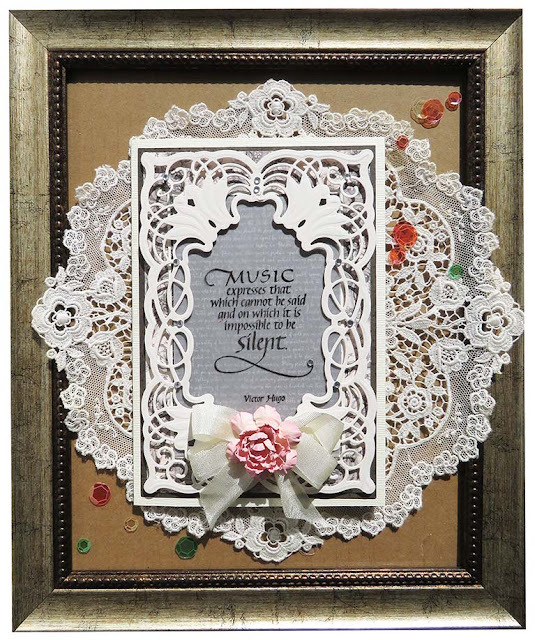 I stamped the image in black for contrast and added subtle pink and white flowers with a green ribbon for accents. 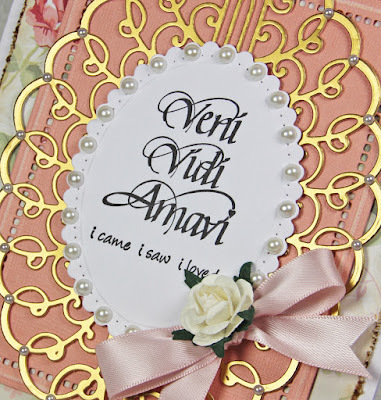 Then i finished it off with some tiny adhesive pearls and a smaller die cut at the top to add more interest to it. Enjoy your day and have fun doing something creative today!! You can do Anything-Affirmation Quotes- ATC's Quietfire Style! Robyn here today with a confession. Suzanne has new stamps on the way and I hadn't even used these newest ones yet. Check back here next week for Sneak Peeks of the new dies! The cards are cut from the sheet of water color paper I use to wipe off my brush when painting. A light, watery blue/green wash was added to tone down and soften the edges. 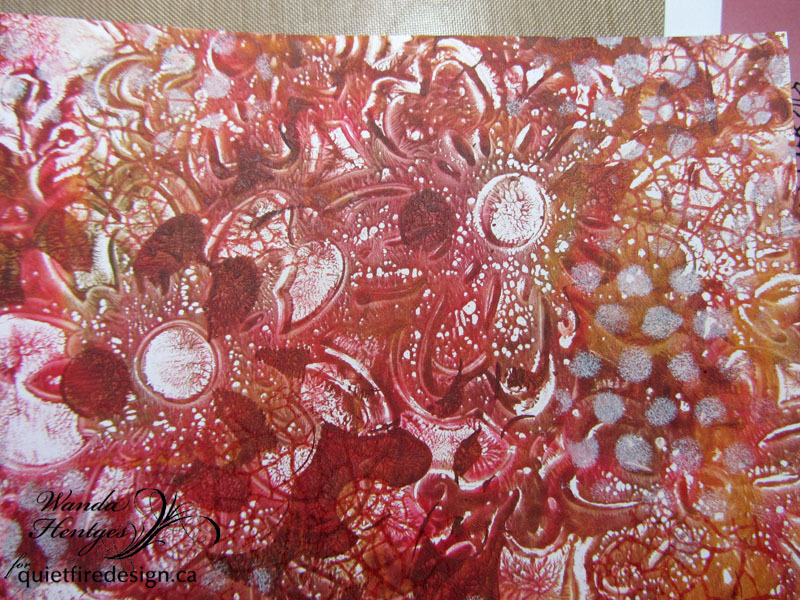 Splatter and border added with some gold gouache. 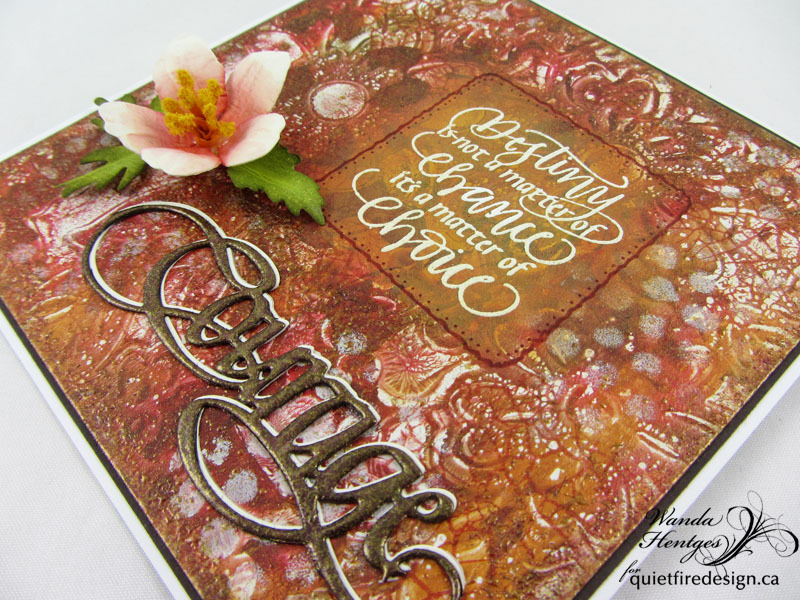 Be sure your paper is completely dry before stamping with Versafine Onyx and thermal embossing clear. 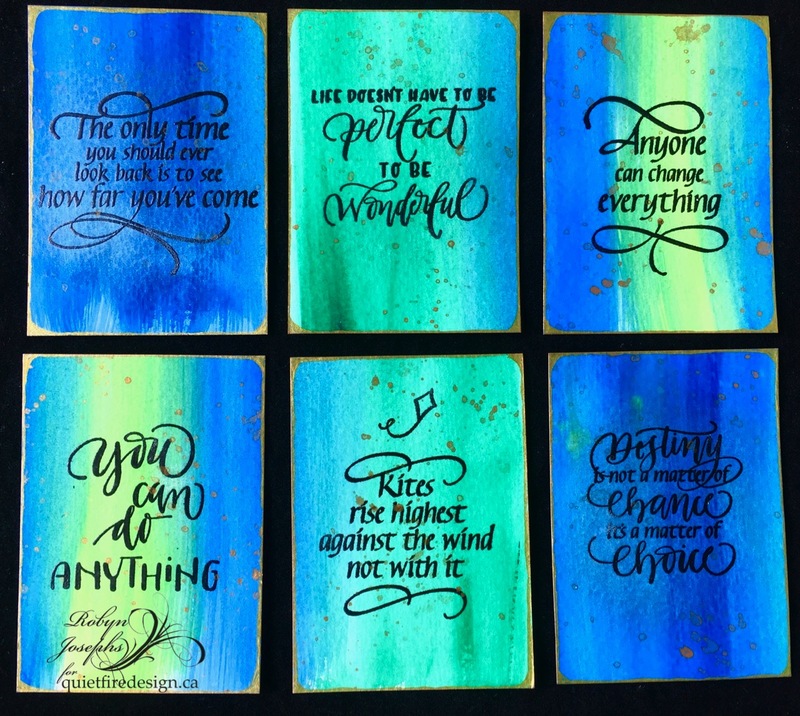 Quick and easy peasy 6 cards to give to friends, family - or yourself -for a bit of affirmation! Comments, words of affirmations and Questions welcomed! 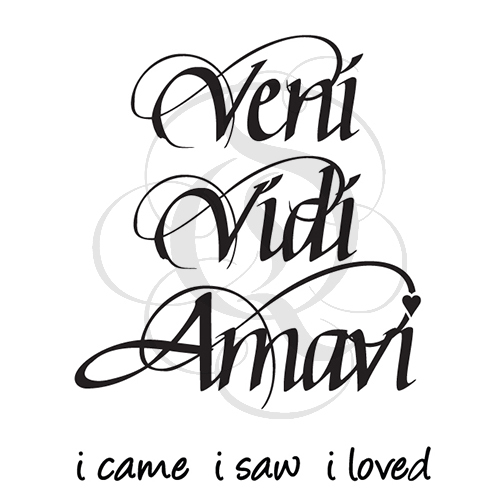 Yvonne here today sharing a card using the Quietfire Design stamp "Veni Vidi Amavi"...what a beautiful quote! 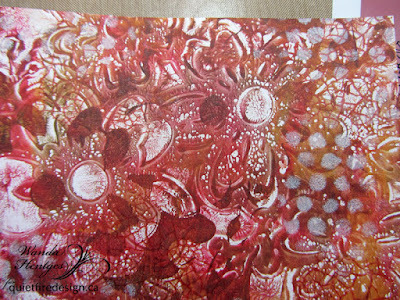 The image was stamped upon white cardstock using a black inkpad. By stacking die-cuts using 3D foam squares you get a lovely 3-dimensional effect on your card. 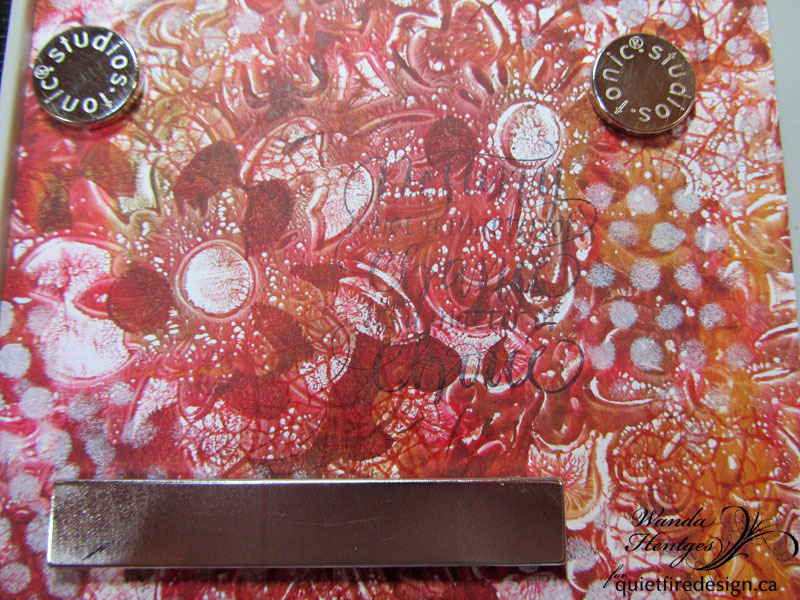 The patterned paper is altered with a distressing tool and some brown ink. Hi Quietfire Design stamp friends, it's Teresa here today to share two new cards i made up for you with the newest stamp release from Quietfire Design. 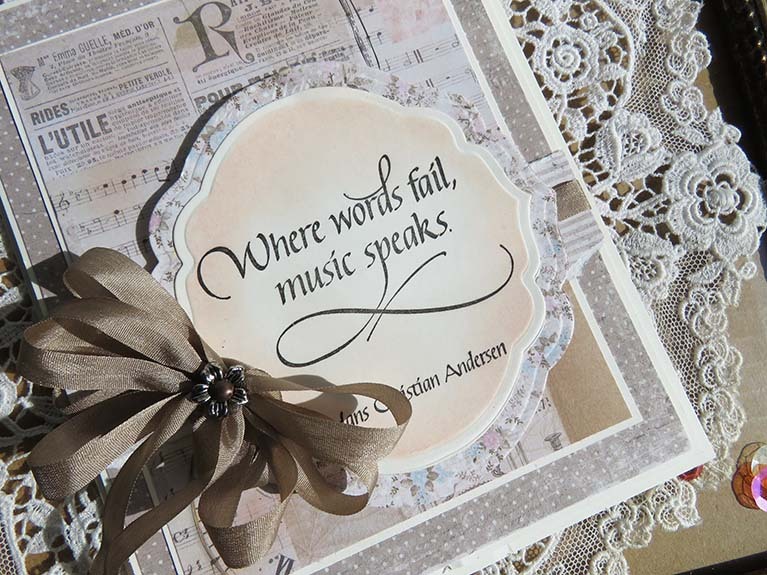 My first card i used "Where words fail" and created a muted color scheme with pretty shades of tan, light pink and grey. I love to find papers that have music on them so this collage type paper went really well. I shaded around the inside of the die with light pink ink to make the sentiment stand out more and finished it with a pretty bow in tan silk. My second card i used another new stamp from the Quietfire store. I really love this beautiful sentiment and being a music fan myself i can so relate to the words of music bringing life to things. 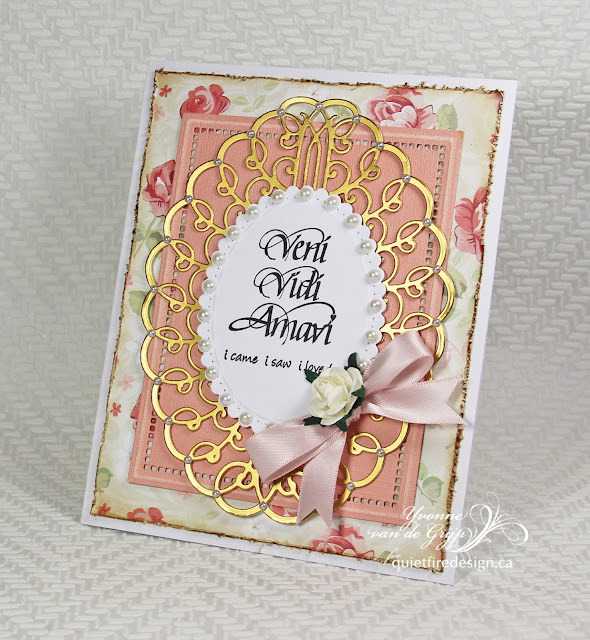 For this card i used a die to create an ivory border around my sentiment and then layered pretty papers in shades of ivory, grey and black to make the base. 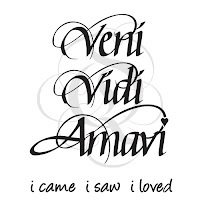 The sentiment i wanted to be sheer so i stamped that on vellum. Then i just finished it with a pretty ivory bow to match and a pink flower that i made from die cuts. 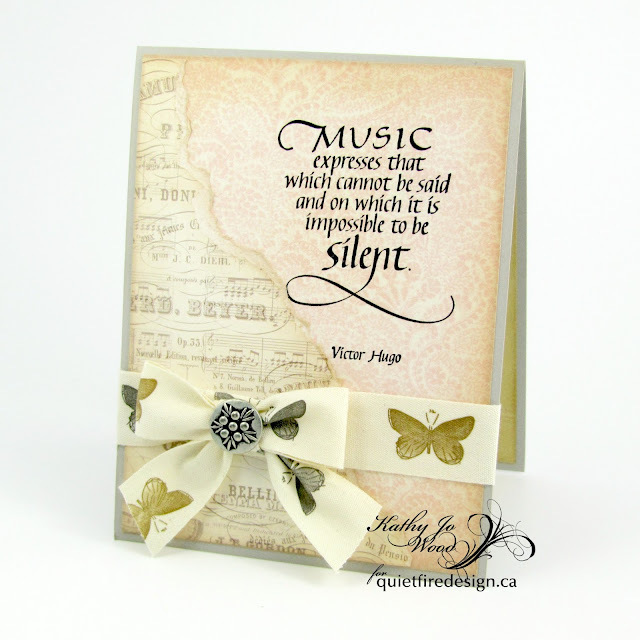 Here is the links to get the stamps in the Quietfire store for you! Quietfire Design Stamp: "Music Expresses"
Quietfire Design Stamp: "Where words Fail"
Is it Monday again?! LOL Without Monday we can't have Friday so I guess it's all good. 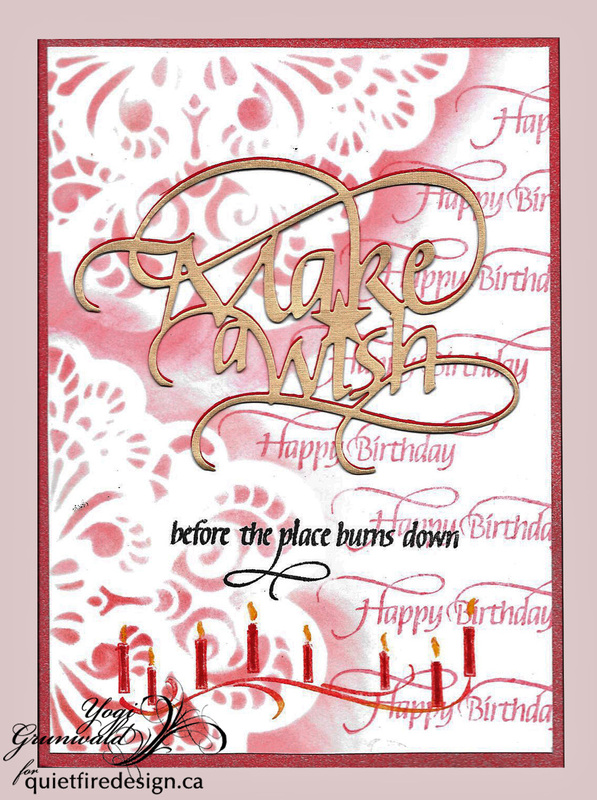 I had fun making this card and even have some step-outs for you. 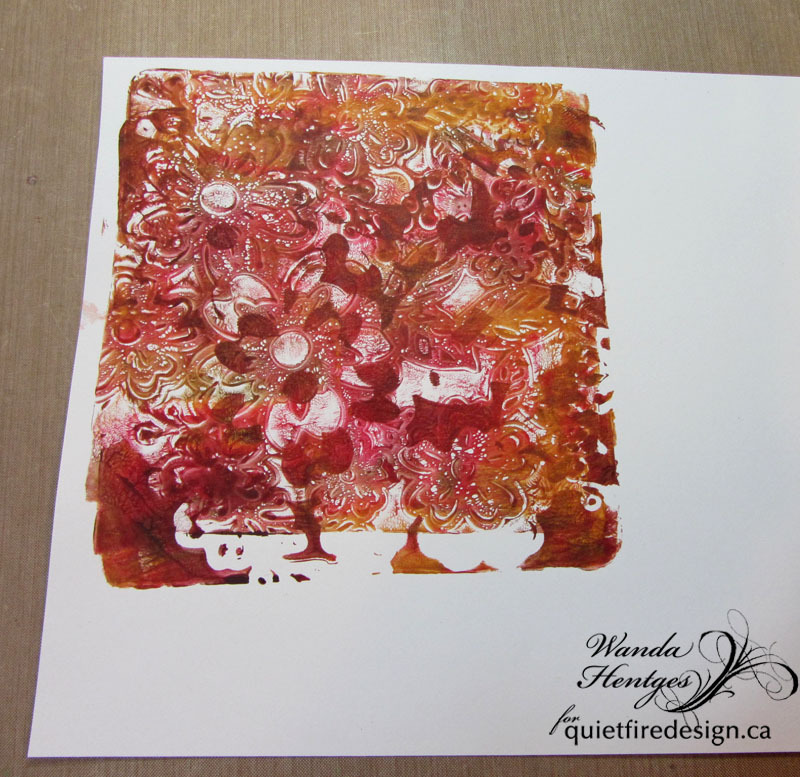 I began with a Gel Press print I pulled from my stack. 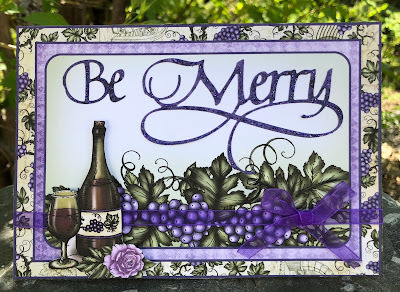 It is cut to 5" square and dots stenciled on (Tim Holtz stencil; PaperArtsy Fresco Finish Paint Chalk Paint in color Chalk). 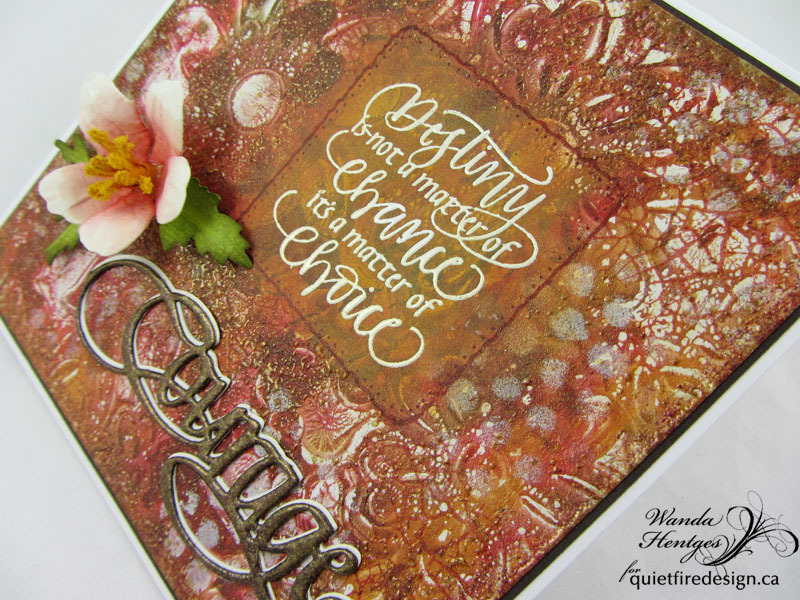 Crackle Background stamped with Archival Ink Red Geranium (Ranger Ink - Wendy Vecchi). 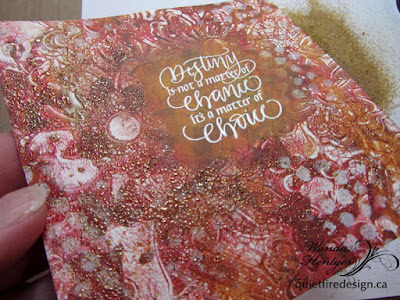 A close up so you can see the stamped Crackle. *I hope I can be clear on this next part* I put the print in my Stamp Platform, put the stamp on my print to determine placement, closed the platform so the stamp stuck to the cover, put grid paper in the platform, inked and stamped the quote onto the grid paper to be sure it was straight, tweaked the placement of the stamp on the cover to make it straight, stamped it again on the grid paper to be sure it was straight, removed the grid paper from the Platform, and finally (without inking the stamp again) stamped onto my print. I wanted just a light stamping to know exactly where I would be stamping for the next part. 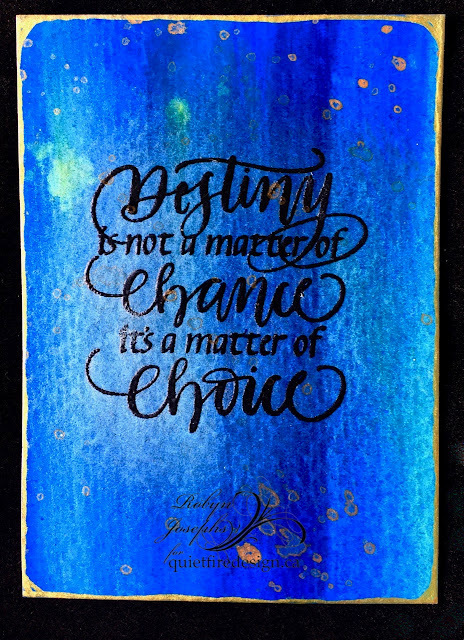 Because my background was busy I wanted to "calm" the area I would be stamping the quote - Destiny. I sponged on PaperArtsy Fresco Finish Paint - Caramel and Pumpkin Soup and then added a litte Brown Shed around the edges of this area to help blend into my background. 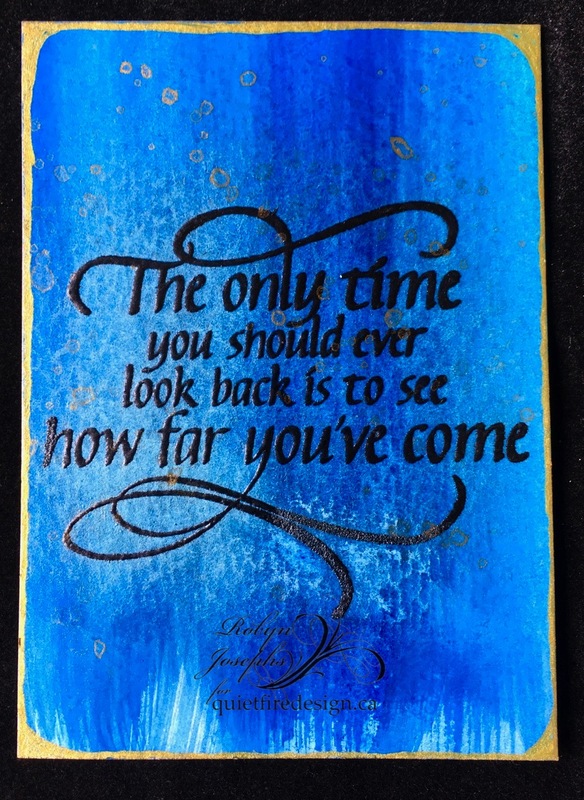 I took the print out of the Platform, dried it, put it back into the platform, stamped with Embossing Ink, removed it from the platform, added white Embossing Powder and heated it. I wasn't sure if it would be better in black or white and went for white. I'm still not sure if it was the best choice? I tore a post it note paper just big enough to cover the quote to use as a mask. 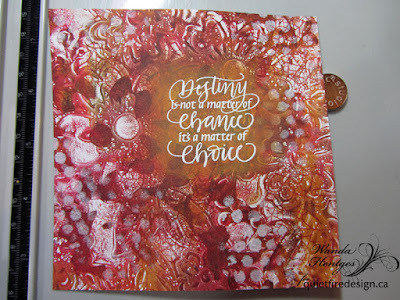 I wanted to use Distress Resist Spray to add Baked Texture Ancient Amber Embossing Powder (Emerald Creek - Seth Apter) to my background. I had my powder ready to go. I put my panel in a box. 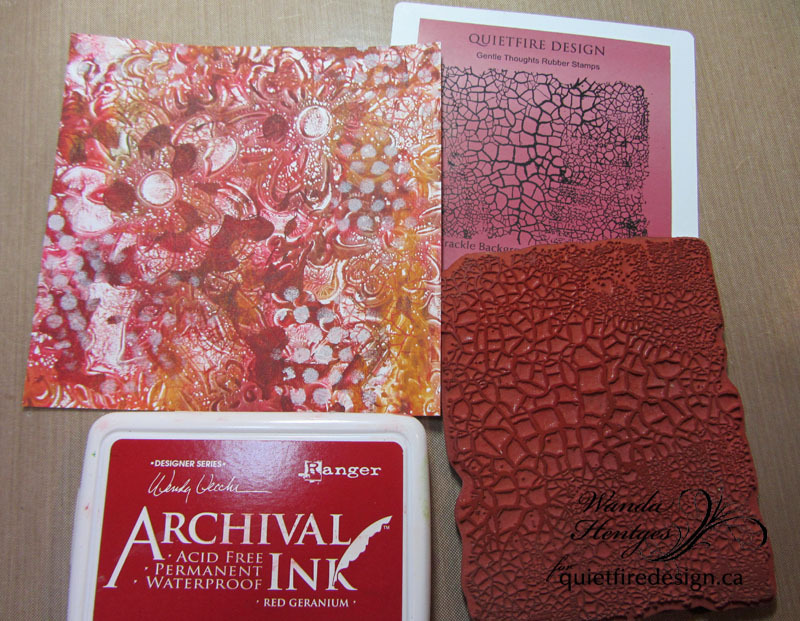 (A box is best because you want to be sure you are not getting the Resist Spray on anything except your paper). I gave a couple spritzes of the Resist Spray, immediately took my panel from the box, removed the mask, added the Embossing Powder, and heated (baked) the powder. Isn't it cool!!!! 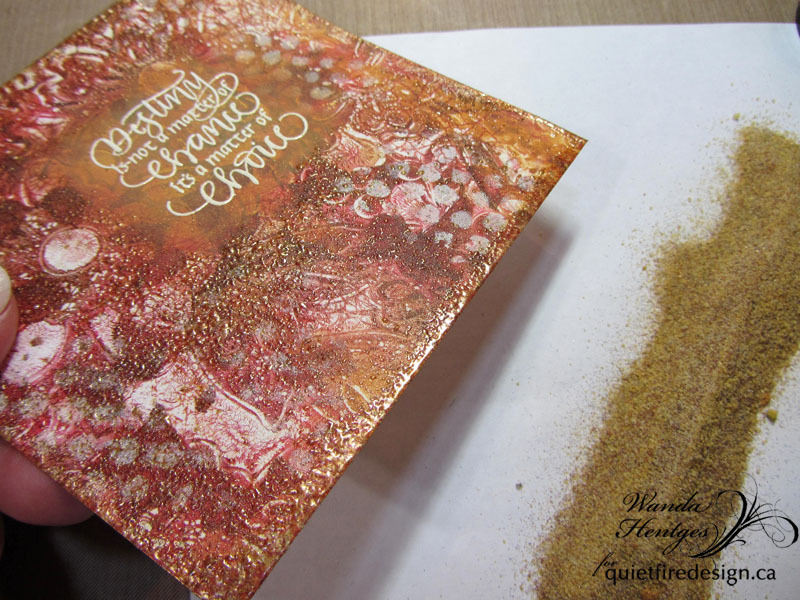 I then added Ancient Amber around the edges using Embossing Ink. 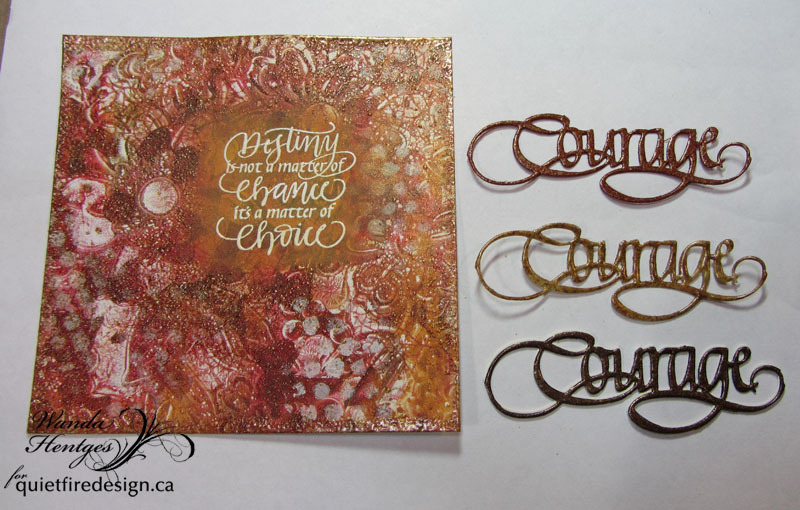 Next I decided I would also use a die cut word and picked Courage. 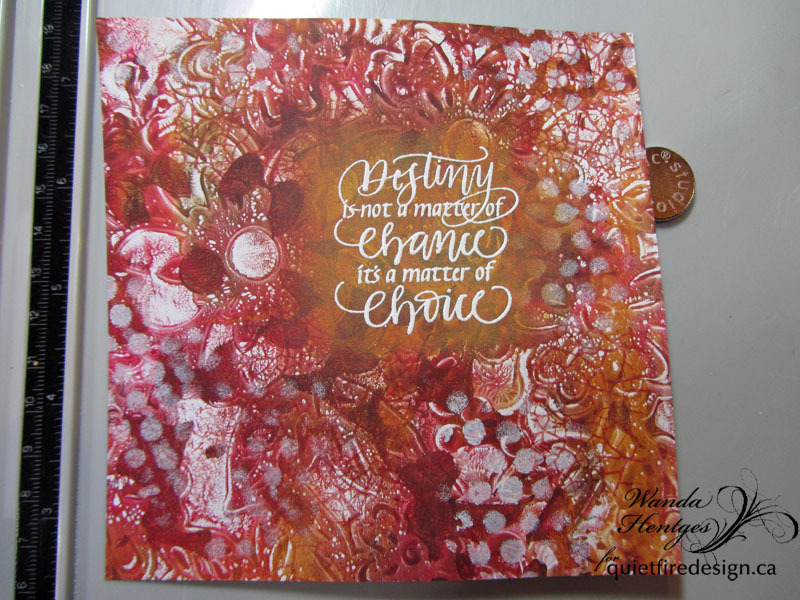 I first cut it from a reddish cardstock and embossed the die cut with Ancient Amber. Decided it matched with the background too much so I also cut one from white cardstock thinking I could stack them off-set and that would work. 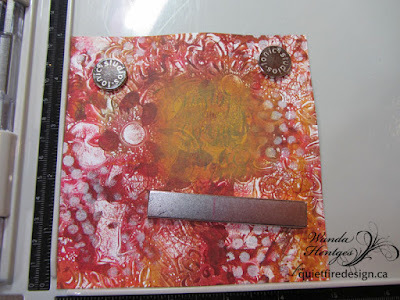 Still didn't work for me so next tried white cardstock also embossed with Ancient Amber. 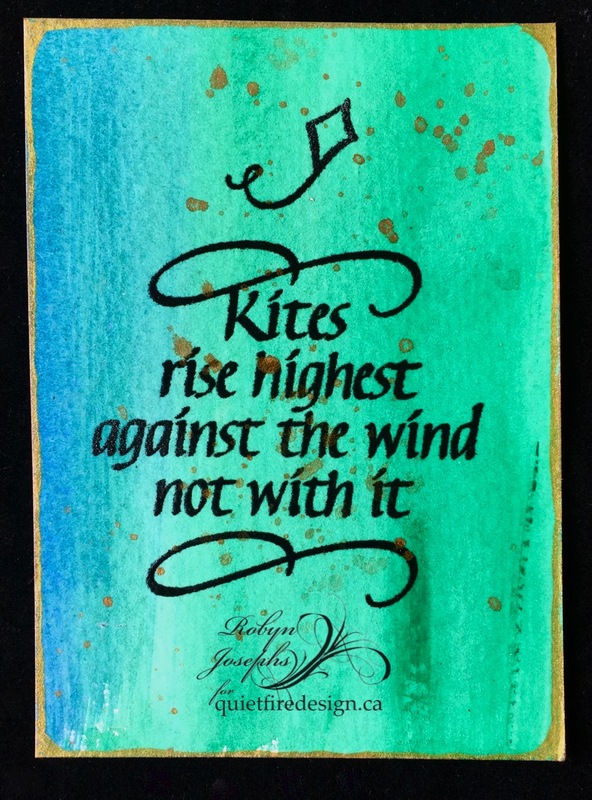 It still wasn't quite right so then I did black cardstock and embossed with Ancient Amber. I was determined to find something that would work embossed with Ancient Amber. LOL I decided the black cardstock and using the white off-set would work. 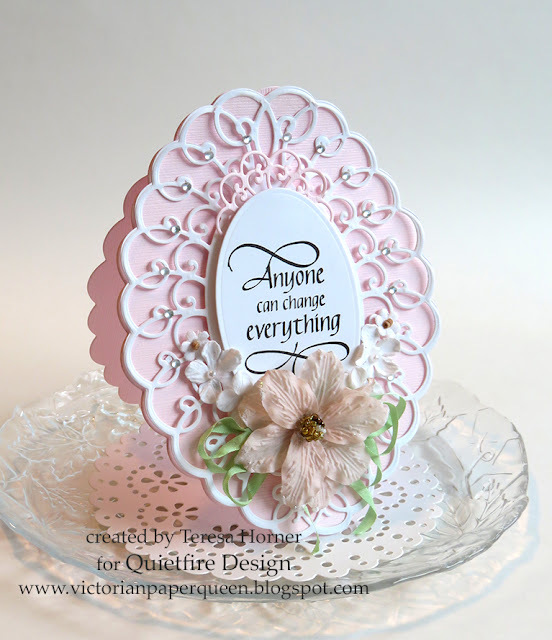 The flower is made using the Elizabeth Craft Design's Susan's Garden cutting die set, Anemone. All the pieces were cut from white cardstock and color was added with inks. I wanted to do more with quote. 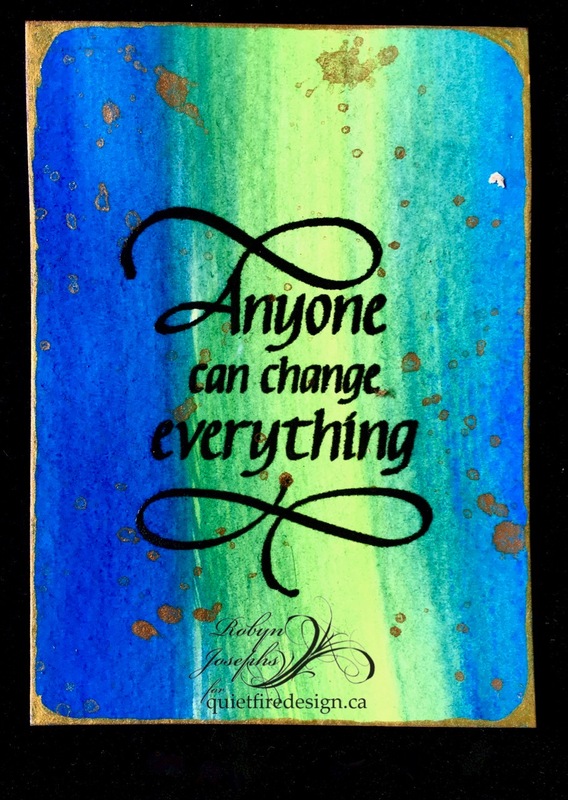 I put the small, square, Tim Holtz acrylic block over the quote, traced around it with a Pitt Pen, removed the block, made a squiggly line over that line with a Sharpie marker and also added dots. I attached the panel to a dark brown panel and then to a folded white card. My finished card measures 5 1/4" square. I hope you like today's project!!!!!! Have a great week!!! 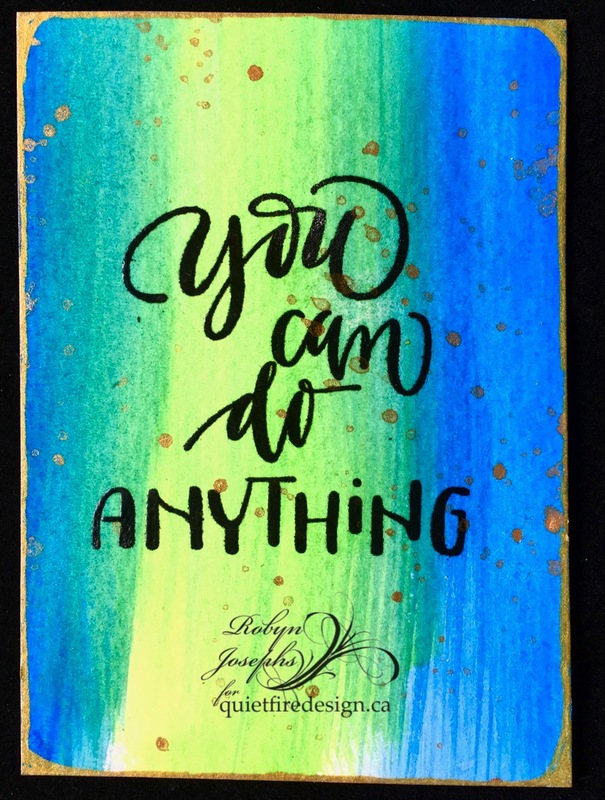 My friend Jane is nearing the end of her chemo and radiation treatments for breast cancer and I wanted to make her a little sign to hang in her kitchen to remind her how strong and brave she’s been! 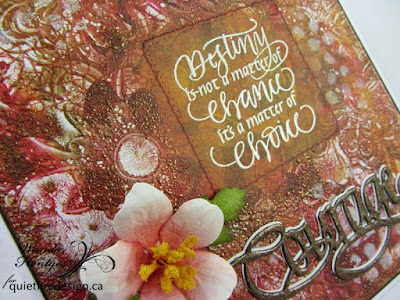 Suzanne Cannon’s Butterfly Flourishes die set captured what I wanted to express – it’s airy and upbeat. I found some washi tape in my stash printed with the words ‘She Flies With Brave Wings’ that was just perfect with the die cuts. 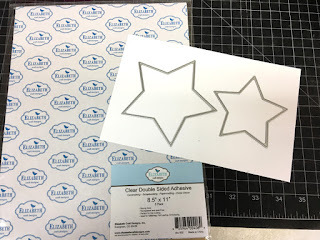 Since the tape has likely been discontinued there are several ways to get the same look: Computer-generate a sentiment and print onto vellum; use clear double sided adhesive tape on the back of the vellum. 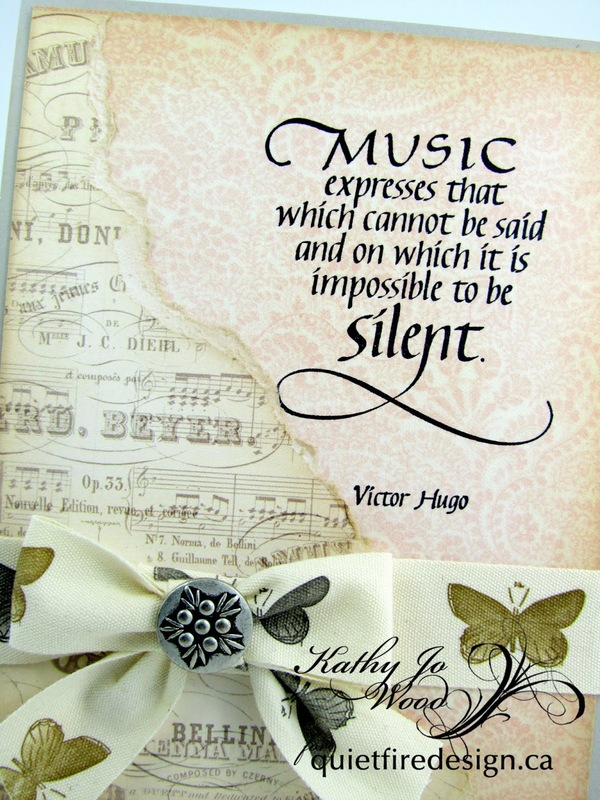 Hand-stamp or hand-letter the words onto ribbon, cardstock, vellum, or solid color washi tape. 1. Choose a color palette that pleases your eye and suits the occasion. Needed: Three Shimmer Sheetz colors and a coordinating piece of patterned paper. 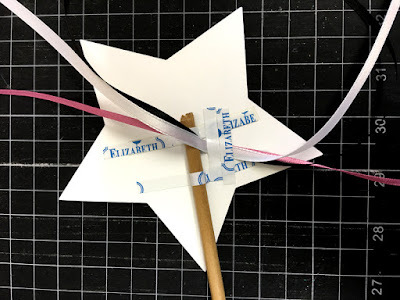 Shown: Background rectangle – Amethyst Gemstone Shimmer Sheetz; Small butterfly flourish and one large butterfly – Pink Iridescent Shimmer Sheetz; Second large butterfly – Light Blue Iridescent Shimmer Sheetz; Patterned paper – origami paper with cherry blossoms. 2. 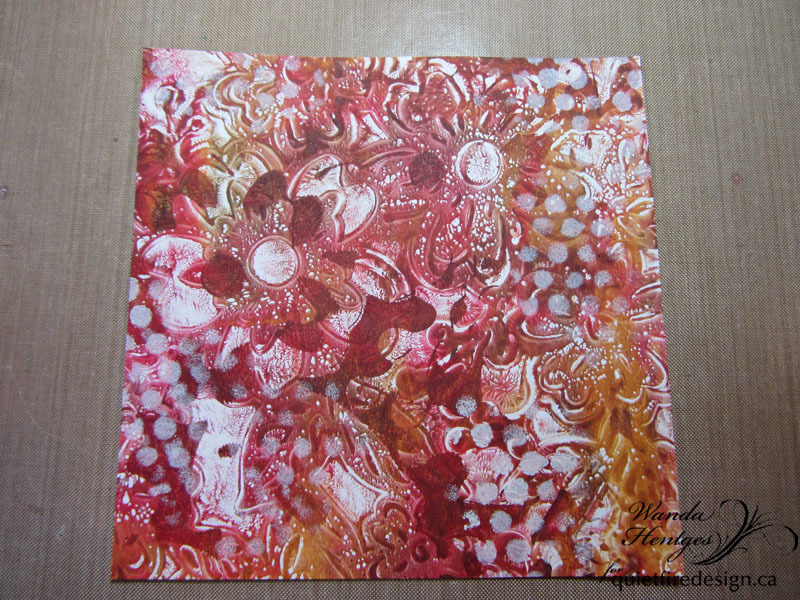 Back a 3” x 4” piece of origami paper or other heavy weight patterned paper with double sided adhesive sheet. Use the large flourish die from the Butterfly Flourishes set to die cut the origami paper. 3. 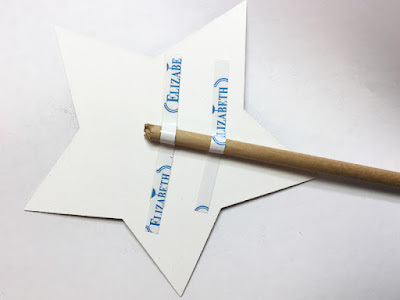 Cut two 3.5” x 4.75” pieces of Shimmer Sheetz and put a piece of double sided adhesive sheet between them. 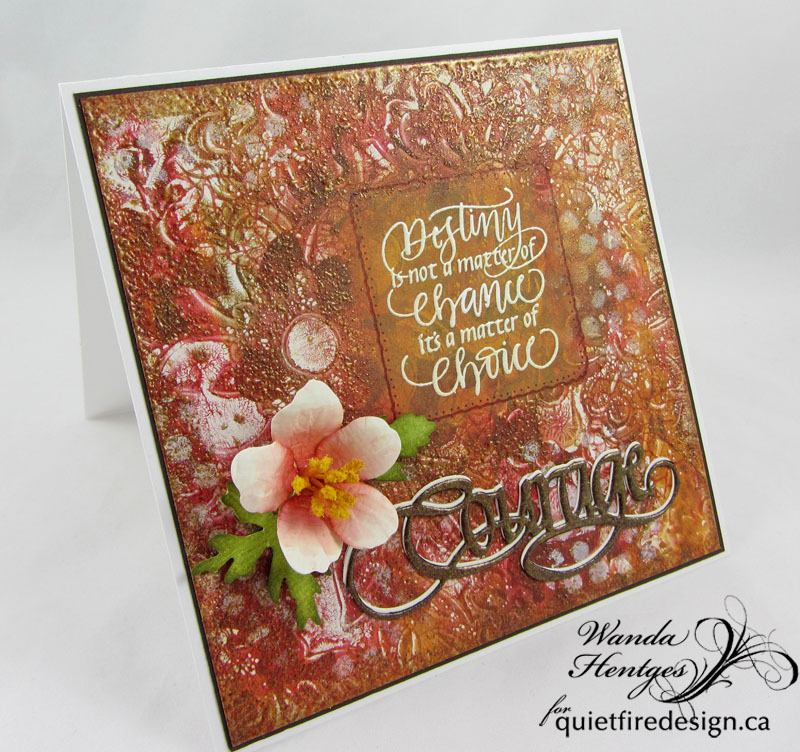 Using the 4.25” x 3” die from the Dashing Rectangles set, cut the rectangle. Use a sanding block and very little hand pressure to lightly sand the front of the rectangle on the diagonal and again on the diagonal in the opposite direction. Dash lines are de-bossed on the front. Refer to the photo below. 4. Die cut the small butterfly flourish and one large butterfly from Pink Iridescent Shimmer Sheetz. Die cut the large butterfly a second time from Light Blue Iridescent Shimmer Sheetz. Bend wings upward on all three. 5. Arrange and adhere the large flourish, small butterfly flourish, and two butterflies (light blue on top) as shown. 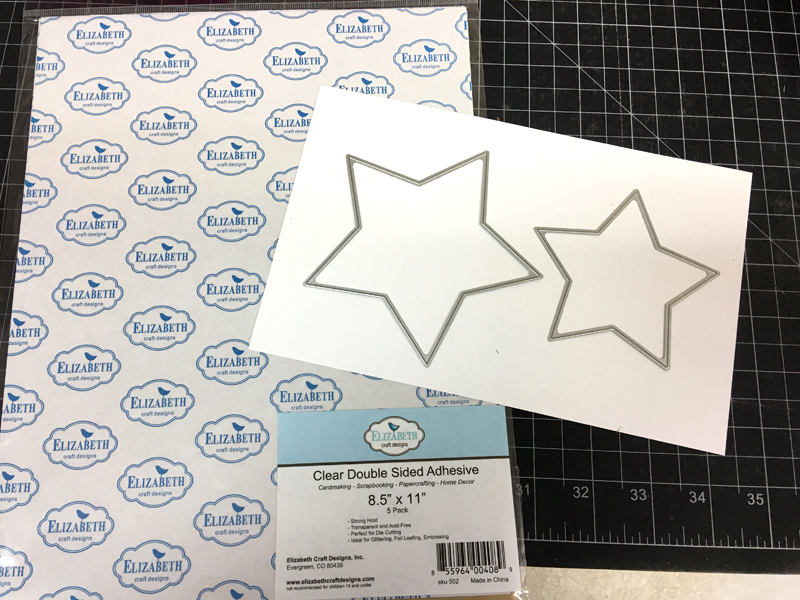 Use non-stick scissors to cut small snippets from Tombow Xtreme Adhesive Tabs to secure the small butterfly flourish and two large ones. 6. Add three-eighth-inch strip with sentiment across the bottom of the rectangle, just above the dashes. 7. Using an awl or piercing tool, pierce two holes at the top left and right, .75” from the sides and .25” from the top edge. 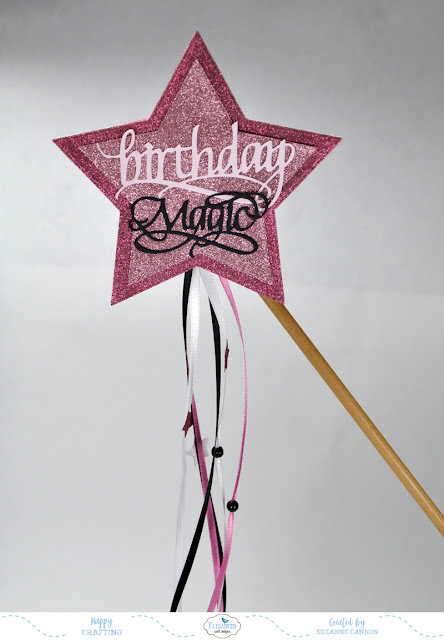 Create a hanging loop with silk cord, metallic braid, or narrow ribbon, fed through the holes from the front and knotted at the back on both sides. Silk cord, metallic braid or narrow ribbon And I found some washi tape printed with the words ‘She Flies With Brave Wings’ that was just perfect with the die cuts. Create 4.25 x 5.5 top fold card using grey card stock. 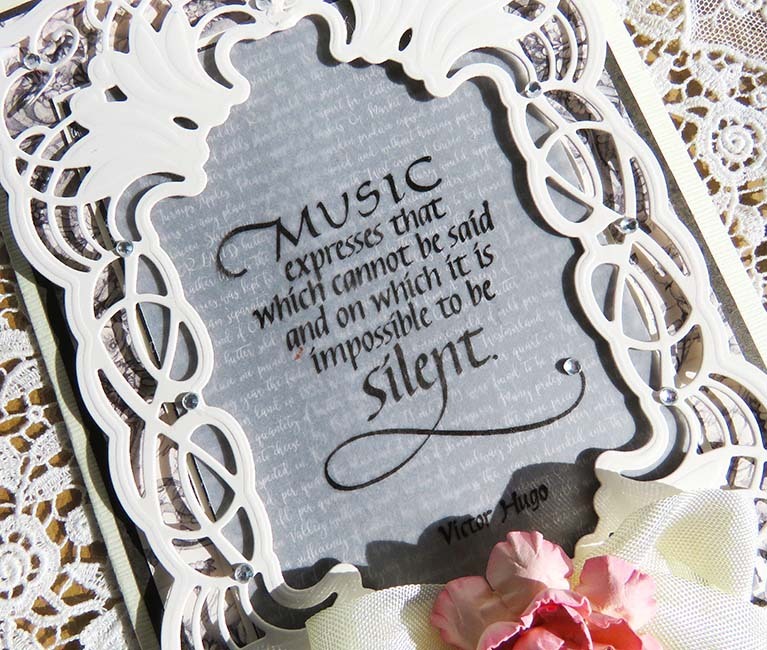 Stamp quote onto patterned pink paper using black archival ink. Cut to size and apply light brown ink along edges for and aged look. Adhere to card front. 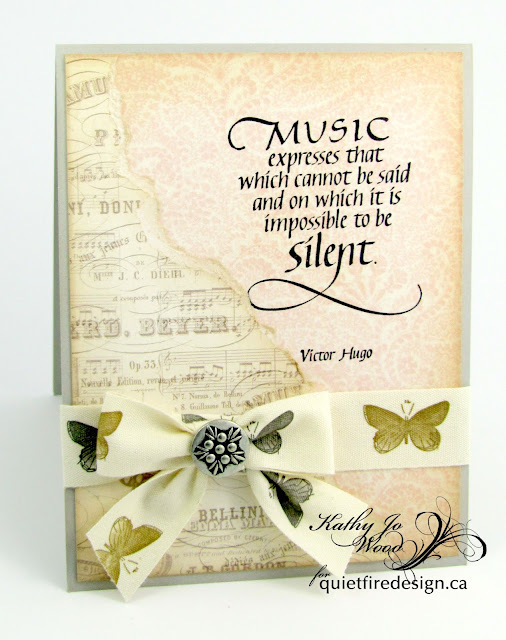 Tear music patterned paper as shown. Cut to size and apply ink along edges. Mount to card front. 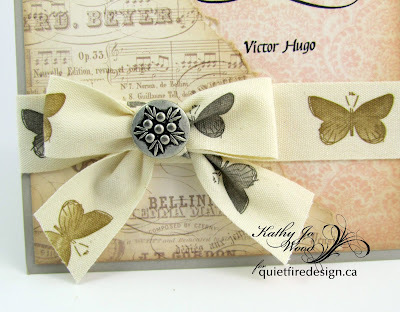 Wrap butterfly ribbon around card front and secure using double sided adhesive tape. Create bow and mount to card front using liquid adhesive. 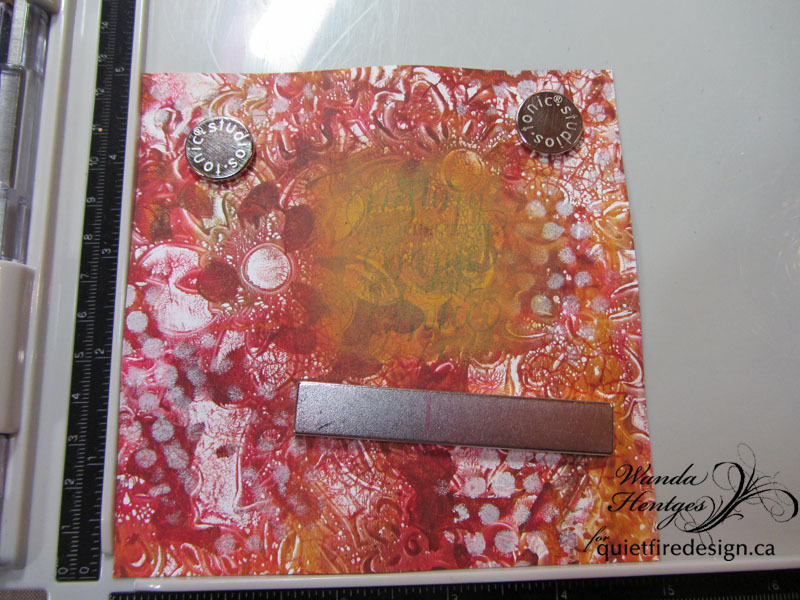 Adhere coordinating metallic button using liquid adhesive. Thank you for stopping by! I do hope you enjoyed the card and it inspires you to create without limits!